This post is part 2 of a series exploring The Nicene-Constantinopolitan Creed (commonly called the Nicene Creed). For other parts, click on the corresponding number: 1, 3, 4, 5, 6, 7, 8, 9, 10, 11, 12, 13. The Creed defines the content of this belief in a way that has stood the test of time, being embraced by Christians of nearly every denominational stripe for over 1600 years! According to Athanasius, who was an influential delegate at Nicaea, the Creed sets forth "the divine and apostolic faith" (quoted in The Trinitarian Faith by T.F. Torrance, p15). According to Torrance, it presents the "simple first principles of the Gospel" (p16). 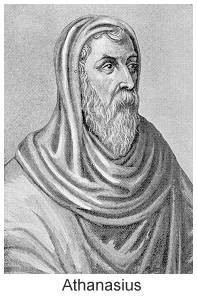 The chief concern of the framers of the Creed, including Athanasius (see picture), was to clarify and defend what the Apostles taught concerning the nature of our triune God. The resultant, carefully chosen words constitute the heart of our Christian faith, which is the doctrine of the Trinity. This doctrine is not merely of academic importance. It speaks to all aspects of the church's being and doing including its worship and mission. In defining this doctrine and others that flow from it, the Creed places a protective 'boundary' around the Christian faith. Thus, it is of immense significance to the church, and on that basis should be taught (in my view) to all Christians, and repeated as a confession of faith in Christian worship. However, a word of caution is in order here: The Creed is not the truth! Rather, the truth is God himself. And that truth comes to us principally not in words, but in God's self-revelation in the person and work of Jesus Christ (p.23). And so we worship the triune God, not words about him, though words about him are very helpful (even essential) to our worship. In reading the Creed, we also are mindful of the limitations of human language. Even with prayerful, Biblically informed consideration, the councils that framed the Creed were "forced to stretch the feeble capacity of...language to give expression to indescribable realities" (p27). That being said, the words of the Creed have stood up remarkably well over 1600 years of study, debate, and worship. It uses words of great meaning that we would do well to seek to understand. Indeed, this humble series is given to that purpose. Some Christians object to the Creed, because it uses words not found in Scripture. I appreciate this concern; it was one I once held. But I came to realize that the Holy Spirit, through Holy Scripture, leads us to seek a deep understanding of God, and then to convey that understanding to others, using words not found in Scripture if need be. Sometimes we may even need to coin a new word, such as "trinity". Athanasius, who was a careful and faithful student of Scripture, pointed out that it does not matter whether a person uses a non-scriptural word or not, so long as he has a "godly mind." As Torrance notes, this father of Nicaea, far from speaking irreverently of Christ, spoke of him with "an exalted mind and a Christ-loving godliness" (p42). May we do so as well!